Marathon reef fishing charters are most often a four hour trip but it can be eight hours if you so choose. This type of charter is best suited for families with small children and clients who just want action. 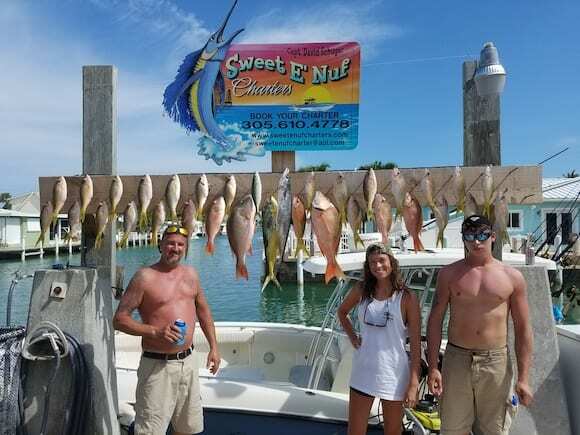 The fish tend to be smaller like yellowtail snapper which average 12-16 inches, and at certain times of the year we catch mangrove snapper and a few grouper. 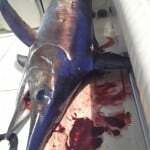 There are a few pelagic fish such as cero mackerel and kingfish and the occasional wahoo or cobia. 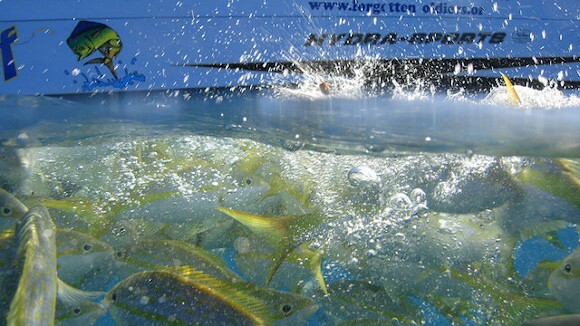 The three different techniques for catching fish on the Florida Keys reef are flat lining, bottom dropping, and live baiting. Flat lining is the main technique we use in the Keys to catch yellowtail snapper. It consists of using light line and fluorocarbon leader to trick these smart snapper. The reason we use such light line and fluorocarbon leader is that yellowtail have great eye sight and will not eat your bait if they see the line. I always chum for them and use small weighted hooks called jigs. The jigs come in all sizes, but depending on current and sea conditions we generally use 1/32, 1/16, 1/8 oz. We tie these jigs to 12-17 pound fluorocarbon leader and then attach to our 15 pound test rods. 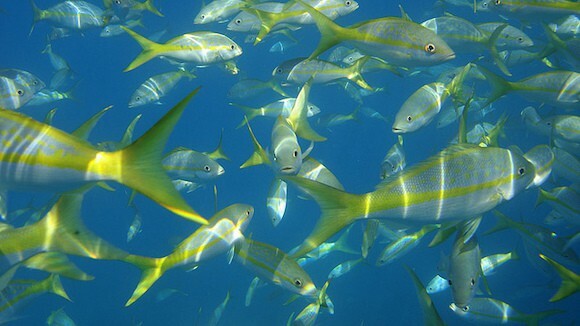 Yellowtail eating chum and bait on Marathon reef fishing charter. Since we are chumming, the fish will be in the chum slick somewhere and the goal is to get the bait to fish naturally. As the chum thaws out it is released into the water and drifting away from the boat at whatever speed the current is moving at that time. We take the bait on a jig and cast into the chum slick and continue to feed the line out, hence flat lining. We keep feeding the line into the water at the current rate of speed, being careful not to put too much in as we won’t see the bite. On the other hand, not feeding enough line will cause your bait to cruise over top of the fish and will result in never getting a bite. The technique has to be perfect to get a bite, as these fish are smart and have great eye sight. 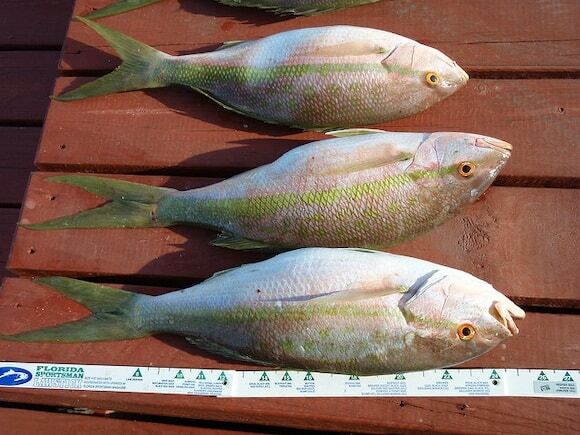 Catch yellowtail snapper one after the other on the reef. When you finally do get a bite, the line will take off out of your hands and at this time you would want to close the bail and start reeling, not setting the hook. Once you have come tight on the fish you may then lift up on the rod and fight your fish. Once you do it a few times you will get a better understanding of this technique. This is the best way to fish for yellowtail snapper and the most productive technique I’ve found in my years fishing the Florida Keys reef. Bottom dropping is much simpler but you won’t catch yellowtail snapper this way. We will catch grouper, mutton snappers, and mangrove snappers. When bottom dropping we use much more stout gear to keep the fish from running into the reef and getting caught in the bottom. Basically from the main line of the rod we slide a weight up and tie a swivel, followed by tying 30-100 pound leader material from the swivel to the 4/0-10/0 hook. Depending what we are fishing for will determine which size leader material and size hook we will use. For big snappers we will use smaller gauge leader and for the grouper we will step it up a bit and use heavy leader and bigger hooks as their mouths are bigger and they don’t mind the heavier leader material most of the time. The bait of choice is live pinfish, grunts, pilchards, cigar minnows, and goggle eyes. We will use dead bait as well for bottom fishing under certain conditions or if live bait is unavailable. When live baiting on the surface for kings and mackerel, we mainly use twenty pound outfits. Tying wire to the main line and using live pilchards, cigar minnows, or goggle eyes. While reef fishing, Kingfish and mackerel patrol around the snapper looking for food and when they see bait on a hook in distress they attack with lightning speed. 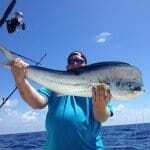 Kingfish and mackerel have great burst of speed and can hit bait at 35 mph and is very exhilarating when they strike. After the strike the battle begins with long runs and they are known for dumping spools in minutes. This is why we use twenty pound gear to ensure that when the big one bites that we won’t be wishing for a bigger fishing pole, as being at anchor we can’t go chase the fish down.